I’ll always remember my first time in a police cell. No I wasn’t caught shoplifting. No I wasn’t drunk and nor was I caught doing anything I shouldn’t of been. I’ve always been respectful of the law and never been in trouble with them. I was only there because of the simple thing of a lack of a different place of safety in my area and that I was in a mental health crisis. It was a Saturday night, I had spent most of the evening walking around the local area, thinking about what way would be the best way to take my own life. I settled on a place BUT a passer-by called the police, they soon turned up and I was detained me under S136 of the mental health act. At this point I was handcuffed, searched and put into the cage in the back of this huge police van (it must of been a public order one) during this time I just shut down, everything become a blur, I remember crying in the back because I thought I was a criminal and that I was cuffed. After a while the van pulled up at the police station, the back opened up and I was dragged out by this 6’2 officer into this other cage, a buzzer went off and once again dragged into where this towering desk was, filled with fear, shame and guilt, I quietly tried to answer the custody sergeants questions all while I was still handcuffed. I said I didn’t know, with tears rolling down my face. I was told that it was because the place of safety at the trust was being used by someone and A&E wouldn’t of accepted me. I had my rights explained, everything taken of me and logged: phone, keys, my books, you name it I had it taken from me. Asked if I wanted to speak to a soilcter, thinking I had still done something wrong I said was, that is what criminals did right? I was taken down into a cell, my hoody, belt and shoes taken away. The door was shut behind me and locked. It was cold, smelt of something stale and the worst thing? The noise… People banging, swearing, threats being shouted, people kicking off. I was terrified, I remember being overloaded with all the noise and having a panic attack. After what seemed like a entity some one come, calmed me down, give me some tea and had a chat, reassured me that I haven’t done anything wrong despite where I was. That helped a lot. After a number of hours layed in the cell, listening and crying, I was assered by the mental health and discharged. 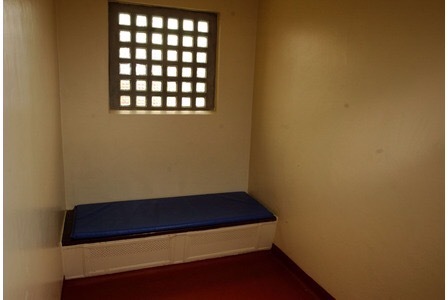 A police cell really isn’t the place for someone in a mental health crisis to be. I was at my most vulnerable, in crisis, quiet, overwhelmed with everything going on in there and exhausted from it all. I really should of been in a place where I could of been in the care of health workers, people who knew what to do, calm me down, keep me safe, someone I could talk to and calm from the noise of people shouting, swearing and kicking off.